How strong can a hurricane get? A hurricane can be regarded as a Carnot heat engine. A hurricane is a huge storm! It can be up to 600 miles across and have strong winds spiraling inward and upward at speeds of 75 to 200 mph. Each hurricane usually lasts for over a week, moving 10-20 miles per hour over the open ocean. Hurricanes gather heat and energy through contact with warm ocean waters. Evaporation from the seawater increases their power. Hurricanes rotate in a counter-clockwise direction around an “eye” in the Northern Hemisphere and clockwise direction in the Southern Hemisphere. 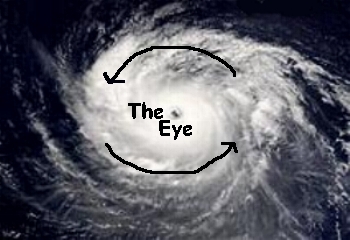 The center of the storm or “eye” is the calmest part. It has only light winds and fair weather. When they come onto land, the heavy rain, strong winds and large waves can damage buildings, trees and cars. Click Here to get your very own Hurricane Tracking Chart. 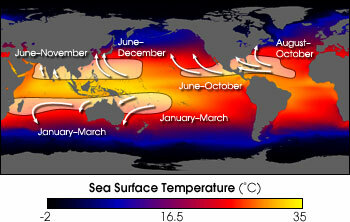 Hurricanes only form over really warm ocean water of 80°F or warmer. The atmosphere (the air) must cool off very quickly the higher you go. Also, the wind must be blowing in the same direction and at the same speed to force air upward from the ocean surface. Winds flow outward above the storm allowing the air below to rise. Hurricanes typically form between 5 to 15 degrees latitude north and south of the equator. The Coriolis Force is needed to create the spin in the hurricane and it becomes too weak near the equator, so hurricanes can never form there. Storm surges are frequently the most devastating element of a hurricane. As a hurricane’s winds spiral around and around the storm, they push water into a mound at the storm’s center. This mound of water becomes dangerous when the storm reaches land because it causes flooding along the coast. The water piles up, unable to escape anywhere but on land as the storm carries it landward. A hurricane will cause more storm surge in areas where the ocean floor slopes gradually. This causes major flooding. As you watch the storm-surge animations, notice the effect that the physical geography of each coastline has on storm surge. Also, note the waves on top of the ocean’s surface. Wind, waves, and sea-level rise all contribute to storm-surge damage. With technology the way it is, there are computer models that allow forecasters to predict the amount of storm surge that will affect a coastal area. These are called Slosh Models and take into account a storm’s strength, its path, how the ocean shallows, and the shape of the land. Then it calculates how much storm surge a hurricane will probably cause. The Atlantic hurricane season is from June 1 to November 30, but most hurricanes occur during the fall months. From 1950 to 1952, tropical cyclones of the North Atlantic Ocean were identified by the phonetic alphabet (Able-Baker-Charlie-etc. ), but in 1953 the US Weather Bureau switched to women’s names. The rest of the world eventually caught on, and naming rights now go by the World Meteorological Organization, which uses different sets of names depending on the part of the world the storm is in. Around the U.S., only women’s names were used until 1979, when it was decided that they should alternate a list that included men’s names too. There’s 6 different name lists that alternate each year. 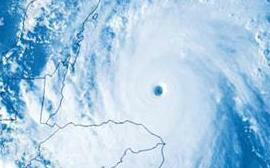 If a hurricane does significant damage, its name is retired and replaced with another. Nothing except geography. Tropical storms occur in several of the world’s oceans, and except for their names, they are essentially the same type of storm. In the Atlantic Ocean, Gulf of Mexico, and the Eastern Pacific Ocean, they are called hurricanes. In the Western Pacific Ocean, they are called typhoons. In the Indian Ocean, the Bay of Bengal, and Australia, these types of storms are called cyclones. Who are the “Hurricane Hunters”? The brave “hurricane hunters” work for the National Oceanic and Atmospheric Administration (NOAA). Each mission lasts about ten hours, with the crews passing four to six times through the storm. The planes carry radar, sophisticated computers, and weather instruments that determine characteristics such as temperature, air pressure, wind speed, and wind direction inside the hurricane. Coastal beach erosion is the wearing away of land, the removal of beach or dune sediments by wave action, tidal currents, wave currents, or drainage. Waves are generated by storms, wind, or hurricanes and can cause coastal erosion. This may take the form of long-term losses of sediment and rocks, or merely the temporary redistribution of coastal sediments. Tropical Tracks: Click to see the tracks of this year’s storms. TROPICAL STORM WATCH – Tropical Storm conditions with sustained winds from 39 -74 mph are possible in your area within the next 36 hours. TROPICAL STORM WARNING – Tropical Storm conditions are expected in your area within the next 24 hours. HURRICANE WATCH – Hurricane conditions with sustained winds of 74 mph or greater are possible in your area within the next 36 hours. This WATCH should trigger your family’s disaster plan, and protective measures should be initiated. Especially, those actions that require extra time such as securing a boat and leaving a barrier island. HURRICANE WARNING – Hurricane conditions are expected in your area within 24 hours. Once this WARNING has been issued, your family should be in the process of completing protective actions and deciding the safest location to be during the storm. Tropical Wave A low pressure trough moving generally westward with the trade winds. Tropical Disturbance An organized area of thunderstorms that usually forms in the tropics. Typically, they maintain their identity for 24 hours and are accompanied by heavy rains and gusty winds. Tropical Cyclone A generic term for any organized low pressure that develops over tropical and sometimes sub-tropical waters. Tropical depressions, tropical storms, and hurricanes are all example of tropical cyclones. Tropical Depression An organized area of low pressure in which sustained winds are 38 mph or less. Tropical Storm A tropical cyclone with maximum sustained wind speeds that range from 39 to 73 mph. Hurricane A tropical cyclone with sustained winds of at least 74 mph.